1. Delegate! You do not need to do everything. It doesn't matter if it's cleaning the silverware or washing up the glasses. Share the burden by assigning some tasks to other family members. 2. Start early. I start preparing little bits at a time as soon as November arrives. 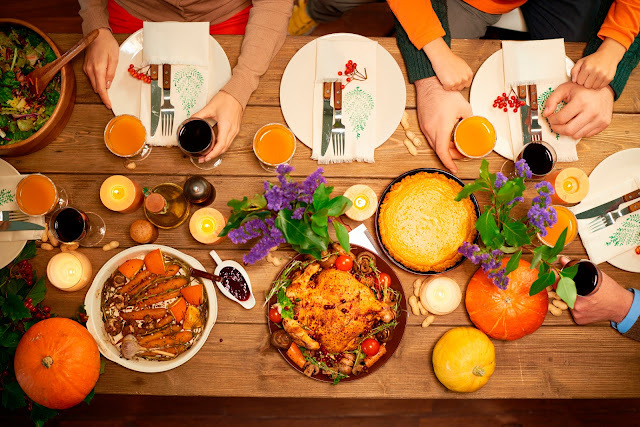 You can clean up the turkey roaster, pull out the serveware and dust the baseboards in the dining room now. Do not try to clean the entire house the same week of Thanksgiving. 3. Pick your menu early. The sooner you know which classic dishes and which new dishes you are going to prepare, the quicker you can make your shopping list and gather all your savings tools. You can go ahead and split your shopping into 3 sections. Bake ahead, non perishables, and fresh ingredients. This will allow you to split your shopping trip into budgetable amounts. 4. Clear spaces. It will help to clear any clutter off countertops, tables and in your fridge and freezer before you begin your grocery shopping. You may consider cleaning out a summer cooler for extra items if space is an issue. 5. Plan Fun. A big part of spending Thanksgiving with my family includes baking dinner rolls with Jimmy, baking pies with Avry and Katy. My husband and I have a glass of wine together before the guests arrive. We have small traditions, that make all the work fun. Be sure to plan time into your schedule for some kitchen chat and memory making.